The first fighter was really winded now. His chest heaved as he tried to catch his breath. 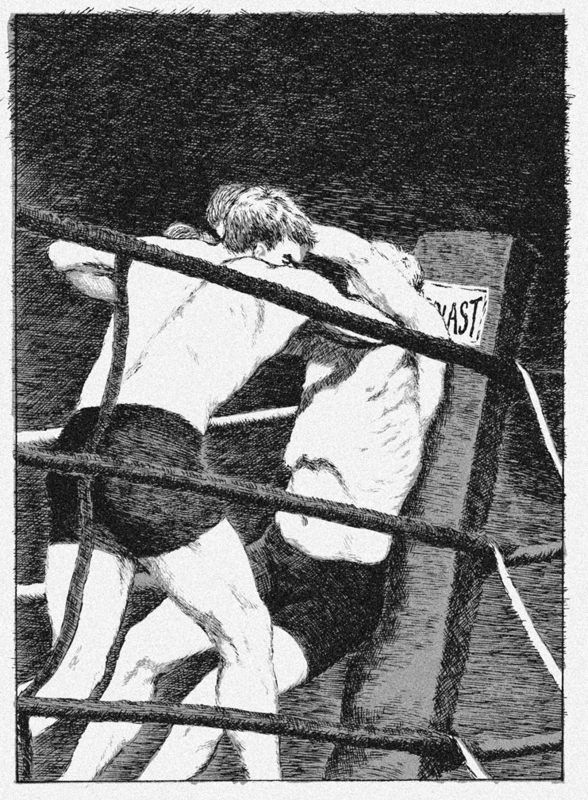 When the referee momentarily broke up the fight, he sort of wobbled in a delerium. The other fighter was still pretty clear headed, and when the first fighter moved in to throw a punch, he got overpowered and knocked around and finally thrown to the matt again. Then the other jumped on top and twisted the first fighter into an inexplicably painful position, then rapidly snapping him in the ear with quick, brutal smacks. At the same time, he jabbed in the kidneys with his knee. The other lay there, struggling for awhile, taking a nasty beating, until finally he wasn’t bracing himself for the impact anymore; his body just convulsed like a bag of sand. Mike patted my back and said, “You alright? You’re being pretty quiet.” He had started drinking very early that morning, so by the time we arrived at the fights that night he was quite drunk and in a fine mood and speaking in a British accent. In fact, I was nauseous. Mike smiled again, almost sympathetically. “Pretty nasty, eh?” He’s much better with violence than I am.